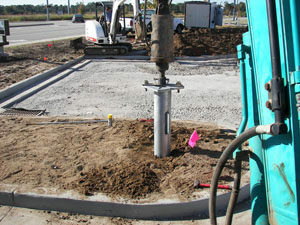 Light pole foundations for foundation repair are installed by Tar Heel Foundation Solutions. Using Earth Contact Products (ECP) brand light pole support anchors, these are a quick and reliable foundation method for at-grade and above-grade applications to support street, site, and parking light poles. The ECP light pole support anchor systems are installed with hydraulic rotary equipment that turns the foundation supports into the ground with the assistance of a helix-shaped plate that acts like a giant screw. To allow for a quick installation, a cableway is precut in the shaft to allow for wiring access through the side and then up through the base plate. Light pole foundations are not like other traditional concrete methods, as they can be installed in any type of weather, no preparation of the site is needed, and there is no time needed for concrete to cure. 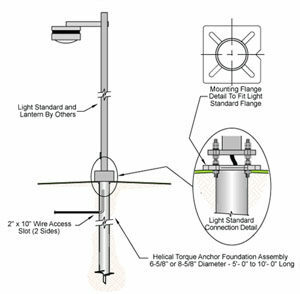 Tar Heel Foundation Solutions can install helical light pole anchors as foundations for street and parking light pole foundations. Ideal for compression and tension forces, helical screw anchor foundations can be used for all types of lighting foundations. ECP is the leading manufacturer of helical foundation anchors for the civil construction and utility industries. ECP produces the highest quality helical anchors and foundation accessories and they are made in the USA. Each high-strength helical foundation anchor has a galvanized helix lead section to which steel extensions of the same size can be added to reach desired depths and or torque readings. Various sizes and configurations are available to match load requirements and soil conditions. Helical ground anchors have changed the construction and utility industry by providing a quick, affordable and verifiable solution to construction and utility professionals. Knowing that Tar Heel Foundation Solutions uses only the highest quality products from ECP and employs knowledgeable and highly-trained staff, you will have peace of mind that you will be safe and satisfied when the job is complete. ECP is "The Very Best" manufacturer of steel foundation repair, waterproofing & anchoring products in the industry.